Valentine Lovebugs, Snails and Flowers...oh my... New Team Group! Home Kool Kitty! We are delighted to have a special DT group join our roster. 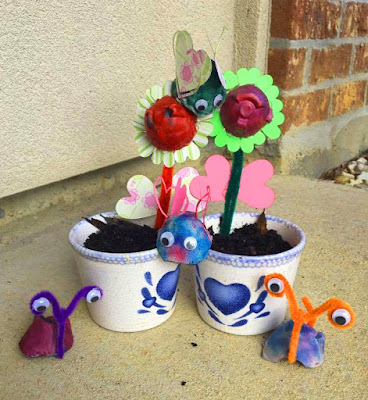 Home Kool Kitty is a home school, gardening loving, recycling young family group! They are using Craftwell products to express their fun side. Welcome to Ericha, Reilee, and Matthew! Cut the egg carton bottom. Next use the eBrush and a sharpie marker to paint the egg carton shell. These will be the bases for the bugs and flowers. Next cutting the wings and flower petals. I used the large heart die as the wings and leaves, and the smaller one for the petals. My daughter, Reilee loves cutting the shapes. Even Matthew has a good cutting, with mommy’s help of course. You will need two wings for each bug and 8 petals. We used a hot glue gun and glued the petals to the backs of the egg carton shells. Next bend a pipe cleaner in half and glue to the back on the flower. The add the large hearts to the stem for leaves. Now to make the snails head…cut about 1 ½ inch above the shell. Make a hook from the 1 ½ in “neck” and wrap it around the folded piece. Next take the ends on the folded and form into circles – as below. Next glue the eyes on the spiral circles you just made. Now your bugs are done. Last step fill your pots and place in your flowers and bugs. AND OF COURSE HAVE FUN!!! We will see you next week as we share our family's projects! Please visit our new blog "Home Kool Kitty". We share our home school adventures and so much more! Fun projects!! They are such creative cuties! !